What is more cuter then bunny nails for Easter? They are perfect for the Holiday, plus they are fun for spring...and they are super adorable. 1. Paint 4 of your nails pink leaving your nail of the ring finger unpainted. Do two coats. 2. Paint your ring finger purple. Do two coats. 3. Repeat step 1 & 2 on the other hand. 4. Take your tooth pick and dip it into the white nail polish. Create half a circle at the edge of your ring finger nail. Carefully use the white nail polish brush to paint in the semi circle. 5. Take the tooth pick and dip it again into the white nail polish and create the the bunny ears. 6. Use a new tooth pick to dip it into the pink nail polish and lightly create a dot a little above the edge of the nail to make a nose. 7. Use another tooth pick to dip into black nail polish, lightly create two little dots above the nose for the eyes. 8. Reuse the pink tooth pick and re-dip it in the pink polish. Lightly fill the middle of the ears for the pink inside of the bunny ears. 9. Repeat steps 4 thru 8 on your other hand. 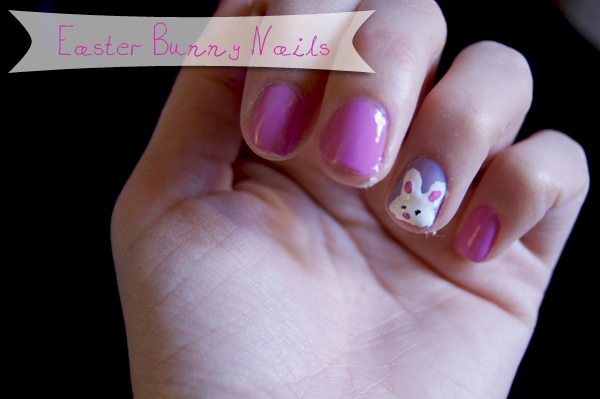 ...Now you have Easter ready nails...or at least happy bunny spring nails. Toothpick in white polish - what a good idea.